Search engine optimization (SEO) can sometimes focus too much on metrics, resulting in a complex series of measurements and calculations that provide little meaningful data about a website's success. Measuring your conversion rate or number of top 10 rankings can tell you a lot about how well your website is performing. Obsessing over your social influence, on the other hand, isn't as productive. The following five commonly-tracked SEO metrics, for instance, don't tell you that much about how your website is performing. So if you're feeling overwhelmed by the number of metrics you're tracking, consider cutting them out of your data collection process entirely. 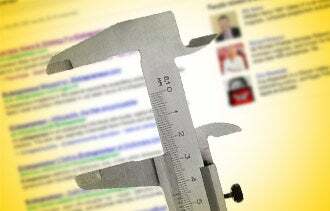 Many website owners who live and die by toolbar PageRank -- the score that appears in toolbar plugins and extensions designed to provide SEO data -- even though Google spokesman Matt Cutts has all but deemed this metric irrelevant. Although Google's servers run PageRank update algorithms that determine how much authority sites should receive in relation to one another, they only push these scores out to the general public a few times a year. As a result, the number displayed by toolbar SEO tools may be woefully out of date, rendering the metric meaningless. By all means, check your toolbar PageRank from time to time. A significant decrease could be an indication that Google has detected and penalized unsavory activity on your website. But when it comes to regular management of common SEO metrics, you can leave this one off the list. Some webmasters measure their SEO success by how many times their websites appear in the first 30 Google results for their target search phrases. But the percentage of natural search users who ever navigate past the first page of results is so small that this metric is nearly meaningless. Instead, focus on top 10 rankings. Getting on the first search engine results page is really the only way to build exposure for your company. Social media signals play a role in your site's SEO because both Google's and Bing's ranking algorithms currently factor in link shares and the relative authority of the sharers. But there's a big difference between publishing content that will attract these social signals and obsessing day after day over exactly how many Facebook "likes" or Twitter "re-tweets" you've attracted. Realistically, whether your website has 50 "likes" or 500 isn't as important to your natural search performance as focusing on other aspects of your marketing strategy -- such as how well your social media referral traffic is converting into buyers or email newsletter subscribers. Check your site's social shares every so often to ensure that they're trending in the right direction, but don't waste time worrying about minute changes in your numbers. Of course website traffic is important, but knowing the number of daily visitors arriving on your site at any given point doesn't make much of a difference. Think about it: It doesn't matter if your website receives 100 or 100 million visitors a day unless you have a method for determining how many are converting into subscribers or buyers. If you haven't put a conversion rate optimization strategy in place, there's no reason to worry about attracting more subscribers because you can't guarantee that your efforts will pay off in increased revenue. Instead of determining whether you attracted a few more visitors to your website today than you did yesterday, focus on how and when conversions are occurring. Then, feel free to track traffic flow -- and conversions -- to your heart's content. Sites such as Klout and PeerIndex have been popping up recently in an attempt to quantify the relative authority of individuals and brands in any given industry. Some people get wrapped up in tracking this metric and trying to increase their scores, but I can't think of a worse way to waste your time. While services like these might have potential in the future, they currently are nothing more than online popularity contests. Rather than spending time trying to win these superficial contests, focus on the areas of your business that will actually enhance your bottom line.